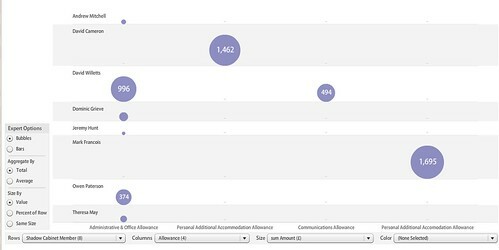 (That’s a test query using the Google visulisation API query language on the Shadow Cabinet expenses (via Google the Shadow Cabinet’s expenses). 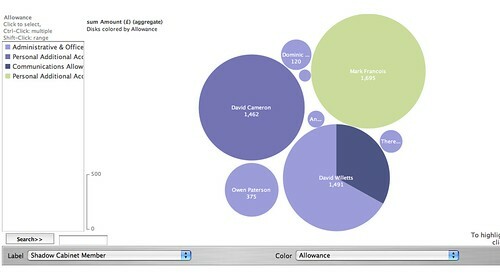 Or if you prefer a bubble chart? Or maybe a matrix chart? Isn’t this fun? :-) So why don’t you have a go????? PS for a more comprehensive review of what’s possible with the query language, I’ve posted a wide selection of examples here: Using Google Spreadsheets as a Database with the Google Visualisation API Query Language. 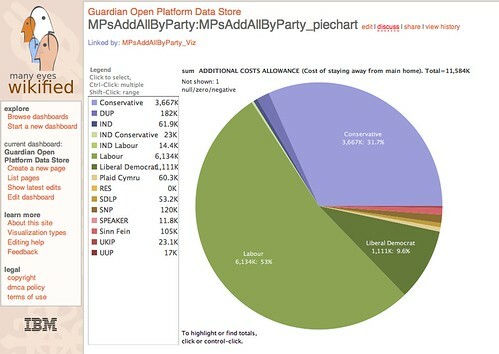 Using the Guardian datastore’s MPs expenses spreadsheet 2007-8 as an example, we can write quite a wide variety of queries, which I’ll show below in their ‘HTML preview’ form. The generic URL is of the form: http://spreadsheets.google.com/tq?tqx=out:html&tq=QUERY&key=phNtm3LmDZEObQ2itmSqHIA. In the examples, I will just show the unencoded select statement, but the link will be the complete, well-formed link. To create your own queries, just hack around the URIs. 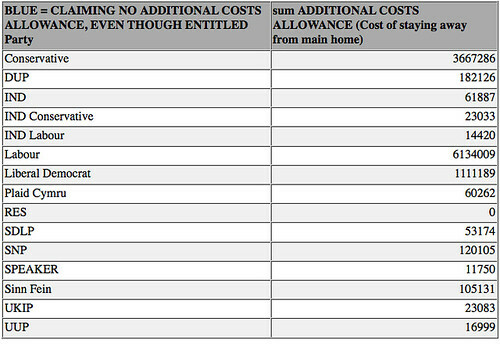 So to recap this final case, then, we are running a query on the original spreadsheet that calculates the total additional costs allowance claims per party, and emits the results as CSV. These results are imported into Many Eyes Wikified, and displayed therein. PS so what other spreadsheets might make for some interesting queries? PPPS If the first row in the table defines column headings, then there are intervening lines (maybe spaces) before the data starts, putting offset N (where N is a number) will skip that many rows before displaying the data. Something else I noticed on the order by setting, this can be of the form order by COL asc (to sort in ascending order, which is the default) or order by COL desc ( to sort in descending order).